We haven’t had a complicated situation all season. Will Thursday give it to us? Absolutely not – and we’re just shy of a double-lock scenario, thanks in part to Bill’s lowball Penultimate Wager (click for my analysis). Bill should wager 600 to lock out Jesse. 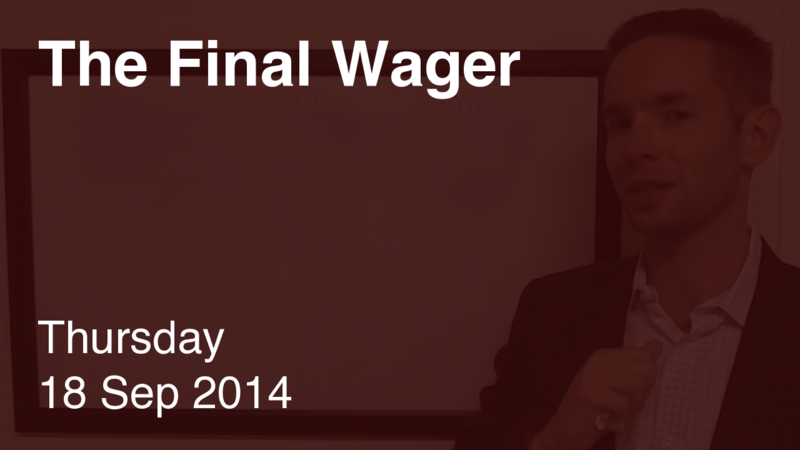 Jesse needs to get it right, so he should wager everything (but at least 8,200). Carrie is out of contention, so she should focus on second. Jesse will have at most 1,200 with a proper wager. So Carrie should cap her wager at 1,199, so as not to hit or fall below that total. I guess even with nearly a full season of The Final Wager available before taping, neither of our challengers sought guidance. Carrie lost a cool grand, and Jesse lucked into it. Yikes.